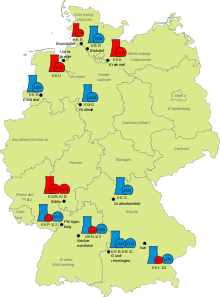 Eight German nuclear power reactors (Biblis A and B, Brunsbüttel, Isar 1, Krümmel, Neckarwestheim 1, Philippsburg 1 and Unterweser) were permanently shut down on 6 August 2011, following the Japanese Fukushima nuclear disaster. A nuclear power phase-out is the discontinuation of usage of nuclear power for energy production. Often initiated because of concerns about nuclear power, phase-outs usually include shutting down nuclear power plants and looking towards fossil fuels and renewable energy. Three nuclear accidents have influenced the discontinuation of nuclear power: the 1979 Three Mile Island partial nuclear meltdown in the United States, the 1986 Chernobyl disaster in the USSR, and the 2011 Fukushima nuclear disaster in Japan. As of 2018, Italy is the only country that operated nuclear reactors that has since phased out nuclear power completely. Following the March 2011 Fukushima nuclear disaster, Germany has permanently shut down eight of its 17 reactors and pledged to close the rest by the end of 2022. Italy voted overwhelmingly to keep their country non-nuclear. Switzerland and Spain have banned the construction of new reactors. Japan’s prime minister has called for a dramatic reduction in Japan’s reliance on nuclear power. Taiwan’s president did the same. Shinzō Abe, the prime minister of Japan since December 2012, announced a plan to re-start some of the 54 Japanese nuclear power plants (NPPs) and to continue some NPP sites under construction. As of 2016, countries including Australia, Austria, Denmark, Greece, Ireland, Italy, Latvia, Liechtenstein, Luxembourg, Malaysia, Malta, New Zealand, Norway, Philippines, and Portugal have no nuclear power stations and remain opposed to nuclear power. Belgium, Germany, Spain and Switzerland are phasing-out nuclear power. Globally, more nuclear power reactors have closed than opened in recent years but overall capacity has increased. Italy is the only country that has permanently closed all of its functioning nuclear plants. Lithuania and Kazakhstan have shut down their only nuclear plants, but plan to build new ones to replace them, while Armenia shut down its only nuclear plant but subsequently restarted it. Austria never used its first nuclear plant that was completely built. Due to financial, political and technical reasons Cuba, Libya, North Korea and Poland never completed the construction of their first nuclear plants (although North Korea and Poland plan to). Azerbaijan, Georgia, Ghana, Ireland, Kuwait, Oman, Peru, Singapore, Venezuela have planned, but not constructed their first nuclear plants. Between 2005 and 2015 the global production of nuclear power declined by 0.7%. 120,000 people attended an anti-nuclear protest in Bonn, Germany, on 14 October 1979, following the Three Mile Island accident. A popular movement against nuclear power has gained strength in the Western world, based on concerns about more nuclear accidents and concerns about nuclear waste. Anti-nuclear critics see nuclear power as a dangerous, expensive way to boil water to generate electricity. The 1979 Three Mile Island accident and the 1986 Chernobyl disaster played a key role in stopping new plant construction in many countries. Major anti-nuclear power groups include Friends of the Earth, Greenpeace, Institute for Energy and Environmental Research, Nuclear Information and Resource Service, and Sortir du nucléaire (France). Several countries, especially European countries, have abandoned the construction of new of nuclear power plants. Austria (1978), Sweden (1980) and Italy (1987) voted in referendums to oppose or phase out nuclear power, while opposition in Ireland prevented a nuclear program there. Countries that have no nuclear plants and have restricted new plant constructions comprise Australia, Austria, Denmark, Greece, Italy, Ireland and Norway. Poland stopped the construction of a plant. Belgium, Germany, Spain, and Sweden decided not to build new plants or intend to phase out nuclear power, although still mostly relying on nuclear energy. New reactors under construction in Finland and France, which were meant to lead a nuclear new build, have been substantially delayed and are running over-budget. However, China has 27 new reactors under construction, and there are also new reactors being built in Belarus, Brazil, India, Japan, Pakistan, Russia, Slovakia, South Korea, Turkey, United Arab Emirates, United Kingdom and the United States of America. At least 100 older and smaller reactors will "most probably be closed over the next 10-15 years". Countries that wish to shut down nuclear power plants must find alternatives for electricity generation; otherwise, they are forced to become dependent on imports. Therefore, the discussion of a future for nuclear energy is intertwined with discussions about fossil fuels or an energy transition to renewable energy. A nuclear power station was built during the 1970s at Zwentendorf, Austria, but its start-up was prevented by a popular vote in 1978. On 9 July 1997, the Austrian Parliament voted unanimously to maintain the country's anti-nuclear policy. Belgium's nuclear phase-out legislation was agreed in July 1999 by the Liberals (VLD and MR), the Socialists (SP.A and PS) and the Greens party (Groen! and Ecolo). The phase-out law calls for each of Belgium's seven reactors to close after 40 years of operation with no new reactors built subsequently. When the law was being passed, it was speculated it would be overturned again as soon as an administration without the Greens was in power. In the federal election in May 2003, there was an electoral threshold of 5% for the first time. Therefore, the Green parties the ECOLO got only 3.06% of the votes. , so ECOLO got no seat in the Chamber of Representatives. In July 2003, Guy Verhofstadt formed his second government. It was a continuation of the Verhofstadt I Government but without the Green parties. In September 2005, the government decided to partially overturn the previous decision, extending the phase-out period for another 20 years, with possible further extensions. In July 2005, the Federal Planning Bureau published a new report, which stated that oil and other fossil fuels generate 90% of Belgian energy use, while nuclear power accounts for 9% and renewable energy for 1%. Electricity only amounts to 16% of total energy use, and while nuclear-powered electricity amounts to 9% of use in Belgium, in many parts of Belgium, especially in Flanders, it makes up more than 50% of the electricity provided to households and businesses. This was one of the major reasons to revert the earlier phase-out, since it was impossible to provide more than 50% of the electricity by 'alternative' energy-production, and a revert to the classical coal-driven electricity would mean inability to adhere to the Kyoto Protocol. In August 2005, French SUEZ offered to buy the Belgian Electrabel, which runs nuclear power stations. At the end of 2005, Suez had some 98.5% of all Electrabel shares. Beginning 2006, Suez and Gaz de France announced a merger. After the federal election in June 2007, a political crisis began and lasted until the end of 2011. In the 2010–2011 Belgian government formation negotiations, the phase-out was emphasized again, with concrete plans to shut off three of the country's seven reactors by 2015. Before the Fukushima nuclear disaster, the plan of the government was for all nuclear power stations to shut down by 2025. Although intermediate deadlines have been missed or pushed back, on 30 March 2018 the Belgian Council of Ministers confirmed the 2025 phase-out date and stated draft legislation would be brought forward later in the year. Nuclear power plant at Grafenrheinfeld, Germany. Chancellor Angela Merkel's coalition announced on May 30, 2011, that Germany’s 17 nuclear power stations will be shut down by 2022, in a policy reversal following Japan's Fukushima Daiichi nuclear disaster. In 2000, the First Schröder cabinet, consisting of the SPD and Alliance '90/The Greens, officially announced its intention to phase out the use of nuclear energy. The power plants in Stade and in Obrigheim were turned off on 14 November 2003, and 11 May 2005, respectively. The plants' dismantling was scheduled to begin in 2007. The year 2000 Renewable Energy Sources Act provided for a feed-in tariff in support of renewable energy. The German government, declaring climate protection as a key policy issue, announced a carbon dioxide reduction target by the year 2005 compared to 1990 by 25%. In 1998, the use of renewables in Germany reached 284 PJ of primary energy demand, which corresponded to 5% of the total electricity demand. By 2010, the German government wanted to reach 10%. ; in fact, 17% were reached (2011: 20%, 2015: 30%). Anti-nuclear activists have argued the German government had been supportive of nuclear power by providing financial guarantees for energy providers. Also it has been pointed out, there were, as yet, no plans for the final storage of nuclear waste. By tightening safety regulations and increasing taxation, a faster end to nuclear power could have been forced. A gradual closing down of nuclear power plants had come along with concessions in questions of safety for the population with transport of nuclear waste throughout Germany. This latter point has been disagreed with by the Minister of Environment, Nature Conservation and Nuclear Safety. In 2011, Deutsche Bank analysts concluded that "the global impact of the Fukushima accident is a fundamental shift in public perception with regard to how a nation prioritizes and values its populations health, safety, security, and natural environment when determining its current and future energy pathways". There were many anti-nuclear protests and, on 29 May 2011, Merkel's government announced that it would close all of its nuclear power plants by December 2022. Following the March 2011 Fukushima nuclear disaster, Germany has permanently shut down eight of its 17 reactors. Galvanised by the Fukushima nuclear disaster, first anniversary anti-nuclear demonstrations were held in Germany in March 2012. Organisers say more than 50,000 people in six regions took part. The German Energiewende designates a significant change in energy policy from 2010. The term encompasses a transition by Germany to a low carbon, environmentally sound, reliable, and affordable energy supply. On 6 June 2011, following Fukushima, the government removed the use of nuclear power as a bridging technology as part of their policy. In September 2011, German engineering giant Siemens announced it will withdraw entirely from the nuclear industry, as a response to the Fukushima nuclear disaster in Japan, and said that it would no longer build nuclear power plants anywhere in the world. The company’s chairman, Peter Löscher, said that "Siemens was ending plans to cooperate with Rosatom, the Russian state-controlled nuclear power company, in the construction of dozens of nuclear plants throughout Russia over the coming two decades". Also in September 2011, IAEA Director General Yukiya Amano said the Japanese nuclear disaster "caused deep public anxiety throughout the world and damaged confidence in nuclear power". A 2016 study shows that after the nuclear phaseout, the security of electricity supply in Germany stayed at the same high level compared to other European countries and even improved in 2014. The study was conducted near the halfway point of the phaseout, 9 plants having been shut and a further 8 still in operation. In early-October 2016, Swedish electric power company Vattenfall began litigation against the German government for its 2011 decision to accelerate the phase-out of nuclear power. Hearing are taking place at the World Bank's International Centre for Settlement of Investment Disputes (ICSID) in Washington DC and Vattenfall is claiming almost €4.7 billion in damages. The German government has called the action "inadmissible and unfounded". These proceedings were ongoing in December 2016, despite Vattenfall commencing civil litigation within Germany. On 5 December 2016, the Federal Constitutional Court (Bundesverfassungsgericht) ruled that the nuclear plant operators affected by the accelerated phase-out of nuclear power following the Fukushima disaster are eligible for "adequate" compensation. The court found that the nuclear exit was essentially constitutional but that the utilities are entitled to damages for the "good faith" investments they made in 2010. The utilities can now sue the German government under civil law. E.ON, RWE, and Vattenfall are expected to seek a total of €19 billion under separate suits. Six cases were registered with courts in Germany, as of 7 December 2016[update]. Nuclear power phase-out commenced in Italy in 1987, one year after the Chernobyl accident. Following a referendum in that year, Italy's four nuclear power plants were closed down, the last in 1990. A moratorium on the construction of new plants, originally in effect from 1987 until 1993, has since been extended indefinitely. In recent years, Italy has been an importer of nuclear-generated electricity, and its largest electricity utility Enel S.p.A. has been investing in reactors in both France and Slovakia to provide this electricity in the future, and also in the development of the EPR technology. In October 2005, there was a seminar sponsored by the government about the possibility of reviving Italian nuclear power. The fourth cabinet led by Silvio Berlusconi tried to implement a new nuclear plan but a referendum held in June 2011 stopped any project. In the Philippines, in 2004, President Gloria Macapagal-Arroyo outlined her energy policy. She wants to increase indigenous oil and gas reserves through exploration, develop alternative energy resources, enforce the development of natural gas as a fuel and coco diesel as alternative fuel, and build partnerships with Saudi Arabia, Asian countries, China and Russia. She also made public plans to convert the Bataan Nuclear Power Plant into a gas-powered facility. In 2017, responding to widespread public concerns after the Fukushima Daiichi nuclear disaster in Japan, the high earthquake risk in South Korea, and a 2013 nuclear scandal involving the use of counterfeit parts, the new government of President Moon Jae-in has decided to gradually phase out nuclear power in South Korea. The three reactors currently under construction will be completed, but the government has decided these will be the last built, and as the existing plants close at a 40 years end-of-life they will be replaced with other modes of generation. A year after the Three Mile Island accident in 1979 the Swedish nuclear power referendum, 1980 was held. It led to the Swedish parliament deciding that no further nuclear power plants should be built, and that a nuclear power phase-out should be completed by 2010. On 5 February 2009, the Government of Sweden effectively ended the phase-out policy. In 2010, Parliament approved for new reactors to replace existing ones. The nuclear reactors at the Barsebäck Nuclear Power Plant were shut down between 1999 and 2005. In October 2015, corporations running the nuclear plants decided to phase out two reactors at Oskarshamn and two at Ringhals, reducing the number of remaining reactors from 12 in 1999 to 6 in 2020. An opinion poll in April 2016 showed that about half of Swedes want to phase out nuclear power, 30 percent want its use continued, and 20 percent are undecided. Prior to the Fukushima Daiichi nuclear disaster in 2011, "a clear majority of Swedes" had been in favour of nuclear power. In June 2016 the opposition parties and the government reached an agreement on Swedish nuclear power. The agreement is to phase out the output tax on nuclear power, and allow ten new replacement reactors to be built at current nuclear plants. An emergency switch-off button of the Beznau Nuclear Power Plant. In 2011, the federal authorities decided to gradually phase out nuclear power in Switzerland. As of 2013[update], the five operational Swiss nuclear reactors were Beznau 1 and 2, Gösgen, Leibstadt, and Mühleberg—all located in the German speaking part of the country. Nuclear power accounted for 36.4% of the national electricity generation, while 57.9% came from hydroelectricity. The remaining 5.7% was generated by other conventional and non-hydro renewable power stations. On 25 May 2011, the Federal Council decided on a slow phase-out by not extending running times or building new power plants. The first power plant, Mühleberg, will stop running in 2019, the last in 2034. There have been many Swiss referenda on the topic of nuclear energy, beginning in 1979 with a citizens' initiative for nuclear safety, which was rejected. In 1984, there was a vote on an initiative "for a future without further nuclear power stations" with the result being a 55 to 45% vote against. On 23 September 1990, Switzerland had two more referenda about nuclear power. The initiative "stop the construction of nuclear power stations", which proposed a ten-year moratorium on the construction of new nuclear power plants, was passed with 54.5% to 45.5%. The initiative for a phase-out was rejected with by 53% to 47.1%. In 2000, there was a vote on a green tax for support of solar energy. It was rejected by 67–31%. On 18 May 2003, there were two referenda: "Electricity without Nuclear", asking for a decision on a nuclear power phase-out, and "Moratorium Plus", for an extension of the earlier-decided moratorium on the construction of new nuclear power plants. Both were turned down. The results were: Moratorium Plus: 41.6% Yes, 58.4% No; Electricity without Nuclear: 33.7% Yes, 66.3% No. The program of the "Electricity without Nuclear" petition was to shut down all nuclear power stations by 2033, starting with Unit 1 and 2 of Beznau nuclear power stations, Mühleberg in 2005, Gösgen in 2009, and Leibstadt in 2014. "Moratorium Plus" was for an extension of the moratorium for another ten years, and additionally a condition to stop the present reactors after 40 years of operation. In order to extend the 40 years by ten more years, another referendum would have to be held (at high administrative costs). The rejection of the Moratorium Plus had come as a surprise to many, as opinion polls before the referendum had showed acceptance. Reasons for the rejections in both cases were seen as the worsened economic situation. In Spain a moratorium was enacted by the socialist government in 1983 and in 2006 plans for a phase-out of seven reactors were being discussed anew. In Ireland, a nuclear power plant was first proposed in 1968. It was to be built during the 1970s at Carnsore Point in County Wexford. The plan called for first one, then ultimately four plants to be built at the site, but it was dropped after strong opposition from environmental groups, and Ireland has remained without nuclear power since. Despite opposing nuclear power (and nuclear fuel reprocessing at Sellafield), Ireland is to open an interconnector to the mainland UK to buy electricity, which is, in some part, the product of nuclear power. Slovenian nuclear plant in Krško (co-owned with Croatia) is scheduled to be closed by 2023, and there are no plans to build further nuclear plants. The debate on whether and when to close the Krško plant was somewhat intensified after the 2005/06 winter energy crisis. In May 2006 the Ljubljana-based daily Dnevnik claimed Slovenian government officials internally proposed adding a new 1000 MW block into Krško after the year 2020. Greece operates only a single small nuclear reactor in the Greek National Physics Research Laboratory in Demokritus Laboratories for research purposes. The future of nuclear power in the United Kingdom is currently under review. The country has a number of reactors which are currently reaching the end of their working life, and it is currently undecided how they will be replaced. The UK is also currently failing to reach its targets for reduction on CO2 emissions, which situation may be made worse if new nuclear power stations are not built. The UK also uses a large proportion of gas-fired power stations, which produce half the CO2 emissions as coal, but there have been recent difficulties in obtaining adequate gas supplies. In 2016 the UK government committed to support the new Hinkley Point C nuclear power station. In the Netherlands, in 1994, the Dutch parliament voted to phase out after a discussion of nuclear waste management. The power station at Dodewaard was shut down in 1997. In 1997 the government decided to end Borssele's operating license, at the end of 2003. In 2003 the shut-down was postponed by the government to 2013. In 2005 the decision was reversed and research in expanding nuclear power has been initiated. Reversal was preceded by the publication of the Christian Democratic Appeal's report on sustainable energy. Other coalition parties then conceded. In 2006 the government decided that Borssele will remain open until 2033, if it can comply with the highest safety standards. The owners, Essent and DELTA will invest 500 million euro in sustainable energy, together with the government, money which the government claims otherwise should have been paid to the plants owners as compensation. New Zealand enacted the New Zealand Nuclear Free Zone, Disarmament, and Arms Control Act 1987 which prohibits the stationing of nuclear weapons on the territory of New Zealand and the entry into New Zealand waters of nuclear armed or propelled ships. This Act of Parliament, however, does not prevent the construction of nuclear power plants. In Australia there are no nuclear power plants. Australia has very extensive, low-cost coal reserves and substantial natural gas and majority political opinion is still opposed to domestic nuclear power on both environmental and economic grounds. Renewable energy, mainly hydropower, is gaining share. For North Korea, two PWRs at Kumho were under construction until that was suspended in November 2003. On 19 September 2005 North Korea pledged to stop building nuclear weapons and agreed to international inspections in return for energy aid, which may include one or more light water reactors – the agreement said "The other parties expressed their respect and agreed to discuss at an appropriate time the subject of the provision of light-water reactor" [sic]. In July 2000, the Turkish government decided not to build four reactors at the controversial Akkuyu Nuclear Power Plant, but later changed its mind. The official launch ceremony took place in April 2015, and the first unit is expected to be completed in 2020. Taiwan has 3 active plants and 6 reactors. Active seismic faults run across the island, and some environmentalists argue Taiwan is unsuited for nuclear plants. Construction of the Lungmen Nuclear Power Plant using the ABWR design has encountered public opposition and a host of delays, and in April 2014 the government decided to halt construction. Construction will be halted from July 2015 to 2017 in order to allow time for a referendum to be held. The 2016 election was won by a government with stated policies that included phasing out nuclear power generation. India has 20 reactors operating, 6 reactors under construction, and is planning an additional 24. Vietnam had developed detailed plans for 2 nuclear power plants with 8 reactors, but in November 2016 decided to abandon nuclear power plans as they were "not economically viable because of other cheaper sources of power." Three of the reactors at Fukushima I overheated, causing meltdowns that eventually led to hydrogen explosions, which released large amounts of radioactive gases into the air. Anti-Nuclear Power Plant Rally on 19 September 2011 at Meiji Shrine complex in Tokyo. Sixty thousand people marched chanting "Sayonara nuclear power" and waving banners, calling on Japan's government to abandon nuclear power, following the Fukushima disaster. Once a nuclear proponent, Prime Minister Naoto Kan became increasingly anti-nuclear following the Fukushima nuclear disaster. In May 2011, he closed the aging Hamaoka Nuclear Power Plant over earthquake and tsunami fears, and said he would freeze plans to build new reactors. In July 2011, Kan said that "Japan should reduce and eventually eliminate its dependence on nuclear energy ... saying that the Fukushima accident had demonstrated the dangers of the technology". In August 2011, the Japanese government passed a bill to subsidize electricity from renewable energy sources. A 2011 Japanese Cabinet energy white paper says "public confidence in safety of nuclear power was greatly damaged" by the Fukushima disaster, and calls for a reduction in the nation's reliance on nuclear power. As of August 2011[update], the crippled Fukushima nuclear plant is still leaking low levels of radioactivity and areas surrounding it could remain uninhabitable for decades. By March 2012, one year after the disaster, all but two of Japan's nuclear reactors were shut down; some were damaged by the quake and tsunami. The following year, the last two were taken off-line. Authority to restart the others after scheduled maintenance throughout the year was given to local governments, and in all cases local opposition prevented restarting. Prime Minister Shinzo Abe's government, reelected on a platform of restarting nuclear power, plans to have nuclear power account for 20 to 22 percent of the country’s total electricity supply by 2030, compared with roughly 30 percent before the disaster at the Fukushima complex. In 2015 two reactors at Sendai nuclear power plant have been restarted. In 2016 Ikata-3 restarted and in 2017 Takahama-4 restarted. The United States is, as of 2013, undergoing a practical phase-out independent of stated goals and continued official support. This is not due to concerns about the source or anti-nuclear groups, but due to the rapidly falling prices of natural gas and the reluctance of investors to provide funding for long-term projects when short term profitability of turbine power is available. Through the 2000s a number of factors led to greatly increased interest in new nuclear reactors, including rising demand, new lower-cost reactor designs, and concerns about global climate change. By 2009, about 30 new reactors were planned, and a large number of existing reactors had applied for upgrades to increase their output. In total, 39 reactors have had their licences renewed, three Early Site Permits have been applied for, and three consortiums have applied for Combined Construction-Operating Licences under the Nuclear Power 2010 Program. In addition, the Energy Policy Act of 2005 contains incentives to further expand nuclear power. However, by 2012 the vast majority of these plans were cancelled, and several additional cancellations followed in 2013. Currently only five new reactors are under construction, and one, at Watts Bar, was originally planned in the 1970s and only under construction now. Construction of the new AP1000 design is underway at two locations in the United States in Georgia and South Carolina. Plans for additional reactors in Florida were cancelled in 2013. Some smaller reactors operating in deregulated markets have become uneconomic to operate and maintain, due to competition from generators using low priced natural gas, and may be retired early. The 556 MWe Kewaunee Power Station is being closed 20 years before license expiry for these economic reasons. Duke Energy's Crystal River 3 Nuclear Power Plant in Florida closed, as it could not recover the costs needed to fix its containment building. As a result of these changes, after reaching peak production in 2007, US nuclear capacity has been undergoing constant reduction every year. In Brazil, nuclear energy, produced by two reactors at Angra, accounts for about 4% of the country's electricity – about 13 TWh per year. Angra III is under construction and due to come online in 2018. Brazil plans to build seven more reactors by 2025. In Argentina, about 6% of the electricity comes from 3 operational reactors: The Embalse plant, a CANDU6 reactor, the Atucha 1 plant, a PHWR German design, and the Atucha 2 plant, also a PHWR German design. Argentina also has some other research reactors, and exports nuclear technology. The nuclear power debate is about the controversy which has surrounded the deployment and use of nuclear fission reactors to generate electricity from nuclear fuel for civilian purposes. The debate about nuclear power peaked during the 1970s and 1980s, when it "reached an intensity unprecedented in the history of technology controversies", in some countries. Proponents of nuclear energy argue that nuclear power is a sustainable energy source which reduces carbon emissions and can increase energy security if its use supplants a dependence on imported fuels. Proponents advance the notion that nuclear power produces virtually no air pollution, in contrast to the chief viable alternative of fossil fuel. Proponents also believe that nuclear power is the only viable course to achieve energy independence for most Western countries. They emphasize that the risks of storing spent fuel are small and can be further reduced by using the latest technology in newer reactors, fuel recycling and long-lived radioisotope burn-up. The operational safety record in the Western world is excellent when compared to the other major kinds of power plants. Opponents say that nuclear power poses many threats to people and the environment. These threats include health risks and environmental damage from uranium mining, processing and transport, the risk of nuclear weapons proliferation or sabotage, and the unsolved problem of radioactive nuclear waste. They also contend that reactors themselves are enormously complex machines where many things can and do go wrong, and there have been many serious nuclear accidents. Critics do not believe that these risks can be reduced through new technology. They argue that when all the energy-intensive stages of the nuclear fuel chain are considered, from uranium mining to nuclear decommissioning, nuclear power is not a low-carbon electricity source. The economics of new nuclear power plants is a controversial subject, since there are diverging views on this topic, and multi-billion dollar investments ride on the choice of an energy source. Nuclear power plants typically have high capital costs for building the plant, but low direct fuel costs (with much of the costs of fuel extraction, processing, use and long term storage externalized). Therefore, comparison with other power generation methods is strongly dependent on assumptions about construction timescales and capital financing for nuclear plants. Cost estimates also need to take into account plant decommissioning and nuclear waste storage costs. On the other hand measures to mitigate global warming, such as a carbon tax or carbon emissions trading, may favor the economics of nuclear power versus fossil fuels. In recent years there has been a slowdown of electricity demand growth and financing has become more difficult, which affects large projects such as nuclear reactors, with very large upfront costs and long project cycles which carry a large variety of risks. In Eastern Europe, a number of long-established projects are struggling to find finance, notably Belene in Bulgaria and the additional reactors at Cernavoda in Romania, and some potential backers have pulled out. Where cheap gas is available and its future supply relatively secure, this also poses a major problem for nuclear projects. Analysis of the economics of nuclear power must take into account who bears the risks of future uncertainties. To date all operating nuclear power plants were developed by state-owned or regulated utility monopolies where many of the risks associated with construction costs, operating performance, fuel price, and other factors were borne by consumers rather than suppliers. Many countries have now liberalized the electricity market where these risks, and the risk of cheaper competitors emerging before capital costs are recovered, are borne by plant suppliers and operators rather than consumers, which leads to a significantly different evaluation of the economics of new nuclear power plants. Following the 2011 Fukushima Daiichi nuclear disaster, costs are likely to go up for currently operating and new nuclear power plants, due to increased requirements for on-site spent fuel management and elevated design basis threats. Nuclear power activities involving the environment; mining, enrichment, generation and geological disposal. The environmental impact of nuclear power results from the nuclear fuel cycle, operation, and the effects of nuclear accidents. The greenhouse gas emissions from nuclear fission power are small relative to those associated with coal, oil, gas, and biomass. They are about equal to those associated with wind and hydroelectric. The routine health risks from nuclear fission power are very small relative to those associated with coal, oil, gas, solar, biomass, wind and hydroelectric. However, there is a "catastrophic risk" potential if containment fails, which in nuclear reactors can be brought about by over-heated fuels melting and releasing large quantities of fission products into the environment. The public is sensitive to these risks and there has been considerable public opposition to nuclear power. Even so, in comparing the fatalities for major accidents alone in the energy sector it is still found that the risks associated with nuclear power are extremely small relative to those associated with coal, oil, gas and hydroelectric. For the operation of a 1000-MWe nuclear power plant the complete nuclear fuel cycle, from mining to reactor operation to waste disposal, the radiation dose is cited as 136 person-rem/year, the dose is 490 person-rem/year for an equivalent coal-fired power plant. The 1979 Three Mile Island accident and 1986 Chernobyl disaster, along with high construction costs, ended the rapid growth of global nuclear power capacity. A further disastrous release of radioactive materials followed the 2011 Japanese tsunami which damaged the Fukushima I Nuclear Power Plant, resulting in hydrogen gas explosions and partial meltdowns classified as a Level 7 event. The large-scale release of radioactivity resulted in people being evacuated from a 20 km exclusion zone set up around the power plant, similar to the 30 km radius Chernobyl Exclusion Zone still in effect. The effect of nuclear accidents has been a topic of debate practically since the first nuclear reactors were constructed. It has also been a key factor in public concern about nuclear facilities. Some technical measures to reduce the risk of accidents or to minimize the amount of radioactivity released to the environment have been adopted. Despite the use of such measures, human error remains, and "there have been many accidents with varying effects as well near misses and incidents". Benjamin K. Sovacool has reported that worldwide there have been 99 accidents at nuclear power plants. Fifty-seven accidents have occurred since the Chernobyl disaster, and 57% (56 out of 99) of all nuclear-related accidents have occurred in the USA. Serious nuclear power plant accidents include the Fukushima Daiichi nuclear disaster (2011), Chernobyl disaster (1986), Three Mile Island accident (1979), and the SL-1 accident (1961). Stuart Arm states, "apart from Chernobyl, no nuclear workers or members of the public have ever died as a result of exposure to radiation due to a commercial nuclear reactor incident." The International Atomic Energy Agency maintains a website reporting recent accidents. Nuclear safety and security covers the actions taken to prevent nuclear and radiation accidents or to limit their consequences. This covers nuclear power plants as well as all other nuclear facilities, the transportation of nuclear materials, and the use and storage of nuclear materials for medical, power, industry, and military uses. Although there is no way to guarantee that a reactor will always be designed, built and operated safely, the nuclear power industry has improved the safety and performance of reactors, and has proposed safer reactor designs, though many of these designs have yet to be tested at industrial or commercial scales. Mistakes do occur and the designers of reactors at Fukushima in Japan did not anticipate that a tsunami generated by an earthquake would disable the backup systems that were supposed to stabilize the reactor after the earthquake. According to UBS AG, the Fukushima I nuclear accidents have cast doubt on whether even an advanced economy like Japan can master nuclear safety. Catastrophic scenarios involving terrorist attacks are also conceivable. An interdisciplinary team from MIT have estimated that given the expected growth of nuclear power from 2005 – 2055, at least four serious nuclear accidents would be expected in that period. To date, there have been five serious accidents (core damage) in the world since 1970 (one at Three Mile Island in 1979; one at Chernobyl in 1986; and three at Fukushima-Daiichi in 2011), corresponding to the beginning of the operation of generation II reactors. This leads to on average one serious accident happening every eight years worldwide. Despite these accidents, the safety record of nuclear power, in terms of lives lost (ignoring nonfatal illnesses) per unit of electricity delivered, is better than every other major source of power in the world, and on par with solar and wind. Global public support for energy sources, based on a survey by Ipsos (2011). The Energy transition is the shift by several countries to sustainable economies by means of renewable energy, energy efficiency and sustainable development. This trend has been augmented by diversifying electricity generation and allowing homes and businesses with solar panels on their rooftops to sell electricity to the grid. In the future this could "lead to a majority of our energy coming from decentralized solar panels and wind turbines scattered across the country" rather than large power plants. The final goal of German proponents of a nuclear power phase-out is the abolishment of coal and other non-renewable energy sources. 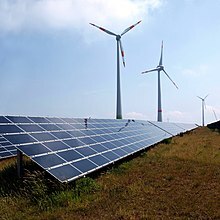 Renewable energy encompasses wind, biomass (such as landfill gas and sewage gas), hydropower, solar power (thermal and photovoltaic), geothermal, and ocean power. These renewable sources serve as alternatives to conventional power generation from thermal power stations run on nuclear or fossil fuels. A significant part of energy transition is reducing consumption by energy conservation and improvements in energy efficiency, an example is improved insulation for buildings; or improved energy efficiency by cogeneration of heat and power. Smart meters are able to charge higher prices at the time consumption peaks during the day, thereby causing electricity demand to drop slightly when the price increases. Issues exist that currently prevent a shift over to a 100% renewable technologies. There is debate over the environmental impact of solar power, and the environmental impact of wind power. Some argue that the pollution produced and requirement of rare earth elements offsets many of the benefits compared to other alternative power sources such as hydroelectric, geothermal, and nuclear power. According to the 2013 Post Carbon Pathways report, which reviewed many international studies, the key roadblocks are: climate change denial, the fossil fuels lobby, political inaction, unsustainable energy consumption, outdated energy infrastructure, and financial constraints. However, according to a research paper published in 2014, renewable energy by itself, will not be able to stop climate change. Google spent $30 million on their RE<C project to develop renewable energy and stave off catastrophic climate change. The project was cancelled after concluding that a best-case scenario for rapid advances in renewable energy could only result in emissions 55 percent below the fossil fuel projections for 2050. Current developments towards a 100% renewable energy policy require solutions to low storage capacity, low energy density, and high cost. ^ a b Annika Breidthardt (30 May 2011). "German government wants nuclear exit by 2022 at latest". Reuters. ^ Henry Sokolski (28 November 2011). "Nuclear Power Goes Rogue". Newsweek. ^ Tsuyoshi Inajima & Yuji Okada (28 October 2011). "Nuclear Promotion Dropped in Japan Energy Policy After Fukushima". Bloomberg. ^ "Nuclear power: When the steam clears". The Economist. 24 March 2011. ^ a b Duroyan Fertl (5 June 2011). "Germany: Nuclear power to be phased out by 2022". Green Left. ^ Erika Simpson and Ian Fairlie, Dealing with nuclear waste is so difficult that phasing out nuclear power would be the best option, Lfpress, 26 February 2016. ^ James Kanter (25 May 2011). "Switzerland Decides on Nuclear Phase-Out". New York Times. ^ "The Database on Nuclear Power Reactors". IAEA. ^ Herbert P. Kitschelt. Political Opportunity and Political Protest: Anti-Nuclear Movements in Four Democracies British Journal of Political Science, Vol. 16, No. 1, 1986, p. 71. ^ Netherlands: Court case on closure date Borssele NPP, article from anti-nuclear organization (WISE), dated 29 June 2001. ^ a b c Nuclear Power in the World Energy Outlook, by the Uranium Institute, 1999. ^ Anti-nuclear resolution of the Austrian Parliament Archived 23 February 2006 at the Wayback Machine, as summarised by an anti-nuclear organisation (WISE). ^ Nuclear news from Poland, article from the Web site of the European Nuclear Society, April 2005. ^ Germany Starts Nuclear Energy Phase-Out, article from Deutsche Welle, 14 November 2003. ^ James Kanter. In Finland, Nuclear Renaissance Runs Into Trouble New York Times, 28 May 2009. ^ Michael Dittmar. Taking stock of nuclear renaissance that never was Sydney Morning Herald, 18 August 2010. ^ "Coalition of Nuclear-Free Countries". WISE News Communique. 26 September 1997. Archived from the original on 23 February 2006. Retrieved 2006-05-19. ^ a b Ruffles, Philip; Michael Burdekin; Charles Curtis; Brian Eyre; Geoff Hewitt; William Wilkinson (July 2003). "An Essential Programme to Underpin Government Policy on Nuclear Power" (PDF). Nuclear Task Force. Retrieved 11 September 2012. ^ Henry, Alain (12 July 2005), Quelle énergie pour un développement durable ?, Working Paper 14-05 (in French), Federal Planning Bureau . ^ Kanter, James (10 August 2005). "Big French Utility Offers a Full Buyout in Belgium". The New York Times. ^ "Belgium plans to phase out nuclear power". BBC News. 31 October 2011. ^ Addicted to nuclear energy? < Belgian news | Expatica Belgium Archived 19 February 2006 at the Wayback Machine. Expatica.com. Retrieved on 2011-06-04. ^ "Belgium maintains nuclear phase-out policy". World Nuclear News. 4 April 2018. Retrieved 5 April 2018. 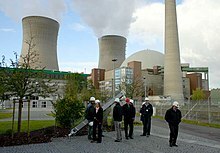 ^ German nuclear energy phase-out begins with first plant closure. Terradaily.com (2003-11-14). Retrieved on 2011-06-04. ^ 'Nuclear phase-out in Germany and the Challenges for Nuclear Regulation' Archived 20 May 2005 at the Wayback Machine. Bmu.de. Retrieved on 2011-06-04. ^ "Germany split over green energy". BBC News. 25 February 2005. ^ Caroline Jorant (July 2011). "The implications of Fukushima: The European perspective". Bulletin of the Atomic Scientists. p. 15. ^ "Anti-nuclear demos across Europe on Fukushima anniversary". Euronews. 11 March 2011. ^ Federal Ministry of Economics and Technology (BMWi); Federal Ministry for the Environment, Nature Conservation and Nuclear Safety (BMU) (28 September 2010). Energy concept for an environmentally sound, reliable and affordable energy supply (PDF). Berlin, Germany: Federal Ministry of Economics and Technology (BMWi). Archived from the original (PDF) on 6 October 2016. Retrieved 1 May 2016. ^ The Federal Government's energy concept of 2010 and the transformation of the energy system of 2011 (PDF). Bonn, Germany: Federal Ministry for the Environment, Nature Conservation, and Nuclear Safety (BMU). October 2011. Archived from the original (PDF) on 6 October 2016. Retrieved 16 June 2016. ^ John Broder (10 October 2011). "The Year of Peril and Promise in Energy Production". New York Times. ^ "Siemens to quit nuclear industry". BBC News. 18 September 2011. ^ "IAEA sees slow nuclear growth post Japan". UPI. 23 September 2011. ^ "Supply security is even more stable despite nuclear phaseout — fossil reserve power is replaceable" (PDF) (Press release). Hamburg, Germany: Greenpeace Energy. 5 September 2016. Retrieved 8 September 2016. ^ Huneke, Fabian; Lizzi, Philipp; Lenck, Thorsten (August 2016). The consequences so far of Germany's nuclear phaseout on the security of energy supply — A brief analysis commissioned by Greenpeace Energy eG in Germany (PDF). Berlin, Germany: Energy Brainpool. Retrieved 8 September 2016. This reference provides a good overview of the phaseout. ^ "Showdown in Germany's nuclear phase-out". Clean Energy Wire (CLEW). Berlin, Germany. 10 October 2016. Retrieved 24 October 2016. ^ a b "Nuclear plant operators continue lawsuits". Clean Energy Wire (CLEW). Berlin, German. 8 December 2016. Retrieved 8 December 2016. ^ "German utilities eligible for "adequate" nuclear exit compensation". Clean Energy Wire (CLEW). Berlin, Germany. 6 December 2016. Retrieved 6 December 2016. ^ "The thirteenth amendment to the Atomic Energy Act is for the most part compatible with the Basic Law" (Press release). Karlsruhe, Germany: Bundesverfassungsgericht. 6 December 2016. Retrieved 6 December 2016. ^ "German utilities win compensation for nuclear phaseout". Deutsche Welle (DW). Bonn, Germany. 5 December 2016. Retrieved 6 December 2016. Provides a history of the nuclear exit. ^ "Atomausstieg: Konzerne klagen weiter – auf Auskunft" [Nuclear exit: corporations sue further - for information]. Der Tagesspiegel (in German). Berlin, German. Retrieved 8 December 2016. ^ "Prospettive dell'energia nucleare in Italia". Retrieved 5 May 2012. ^ Kidd, Steve (30 January 2018). "Nuclear new build - where does it stand today?". Nuclear Engineering International. Retrieved 12 February 2018. ^ "Korea's nuclear phase-out policy takes shape". World Nuclear News. 19 June 2017. Retrieved 12 February 2018. ^ Borgenäs, Johan (11 November 2009). "Sweden Reverses Nuclear Phase-out Policy". Nuclear Threat Initiative. ^ "Sweden to replace existing nuclear plants with new ones". BBC News Online. 18 June 2010. ^ a b "30 years after Chernobyl: Half of Swedes oppose nuclear power". Sveriges Radio. 26 April 2016. ^ "Sweden strikes deal to continue nuclear power". The Local. 10 June 2016. ^ Juhlin, Johan. "Klart i dag: så blir den svenska energipolitiken". svt.se (in Swedish). Sveriges Television. Retrieved 13 June 2016. ^ «Mutiger Entscheid» bis «Kurzschlusshandlung» (Politik, Schweiz, NZZ Online). Nzz.ch. Retrieved on 2011-06-04. ^ Schweiz plant Atomausstieg – Schweiz – derStandard.at › International. Derstandard.at. Retrieved on 2011-06-04. ^ Bundesamt für Energie BFE – Startseite[dead link]. Energie-schweiz.ch. Retrieved on 2011-06-04. ^ "Spain halts nuclear power". WISE News Communique. 24 May 1991. Retrieved 19 May 2006. ^ "Nuclear Power in Spain". World Nuclear Association. May 2006. Archived from the original on 22 February 2006. Retrieved 19 May 2006. ^ "404 error". Archived from the original on 18 February 2005. Retrieved 19 May 2006. ^ "Ground broken for Turkey's first nuclear power plant". World Nuclear News. 15 April 2015. Retrieved 19 April 2015. ^ Andrew Jacobs (12 January 2012). "Vote Holds Fate of Nuclear Power in Taiwan". New York Times. Retrieved 13 January 2012. ^ "Taiwan to halt construction of fourth nuclear power plant". Reuters. 28 April 2014. Retrieved 28 April 2014. ^ Lin, Sean (4 February 2015). "AEC approves plan to shutter fourth nuclear facility". Taipei Times. Retrieved 5 March 2015. ^ "EDITORIAL: Taiwan bows to public opinion in pulling plug on nuclear power". The Asahi Shimbun. 31 October 2016. Retrieved 31 October 2016. ^ "Vietnam ditches nuclear power plans". Deutsche Welle. Associated Press. 10 November 2016. Retrieved 11 November 2016. ^ Martin Fackler (1 June 2011). "Report Finds Japan Underestimated Tsunami Danger". New York Times. ^ David H. Slater (9 November 2011). "Fukushima women against nuclear power: finding a voice from Tohoku". The Asia-Pacific Journal. Archived from the original on 14 February 2014. ^ Hiroko Tabuchi (13 July 2011). "Japan Premier Wants Shift Away From Nuclear Power". New York Times. ^ Chisaki Watanabe (26 August 2011). "Japan Spurs Solar, Wind Energy With Subsidies, in Shift From Nuclear Power". Bloomberg. ^ "Areas near Japan nuclear plant may be off limits for decades". Reuters. 27 August 2011. ^ "Kyushu restarts second reactor at Sendai plant under tighter Fukushima-inspired rules". The Japan Times Online. 15 October 2015. ISSN 0447-5763. Retrieved 19 October 2015. ^ "Some merchant nuclear plants could face early retirement: UBS". Platts. 9 January 2013. Retrieved 10 January 2013. 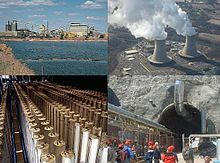 ^ "Dominion To Close, Decommission Kewaunee Power Station". Dominion. 22 October 2012. Retrieved 28 February 2013. ^ Caroline Peachey (1 January 2013). "Why are North American plants dying?". Nuclear Engineering International. Retrieved 28 February 2013. ^ Brazil plans to build seven nuclear reactors — MercoPress. Mercopress.com. Retrieved on 2011-06-04. ^ "Sunday Dialogue: Nuclear Energy, Pro and Con". New York Times. 25 February 2012. ^ MacKenzie, James J. (December 1977). "Review of The Nuclear Power Controversy] by Arthur W. Murphy". The Quarterly Review of Biology. 52 (4): 467–8. doi:10.1086/410301. JSTOR 2823429. ^ Walker, J. Samuel (10 January 2006). Three Mile Island: A Nuclear Crisis in Historical Perspective. University of California Press. pp. 10–11. ISBN 9780520246836. ^ Kitschelt, Herbert P. (1986). "Political Opportunity and Political Protest: Anti-Nuclear Movements in Four Democracies" (PDF). British Journal of Political Science. 16 (1): 57. doi:10.1017/S000712340000380X. ^ U.S. Energy Legislation May Be `Renaissance' for Nuclear Power. ^ Bernard Cohen. "The Nuclear Energy Option". Retrieved 9 December 2009. ^ "Nuclear Energy is not a New Clear Resource". Theworldreporter.com. 2 September 2010. ^ Giugni, Marco (2004). Social protest and policy change: ecology, antinuclear, and peace movements in comparative perspective. Rowman & Littlefield. pp. 44–. ISBN 9780742518278. ^ Stephanie Cooke (2009). In Mortal Hands: A Cautionary History of the Nuclear Age, Black Inc., p. 280. ^ Sovacool, Benjamin K. (2008). "The costs of failure: A preliminary assessment of major energy accidents, 1907–2007". Energy Policy. 36 (5): 1802–20. doi:10.1016/j.enpol.2008.01.040. ^ Jim Green . Nuclear Weapons and 'Fourth Generation' Reactors Chain Reaction, August 2009, pp. 18-21. ^ Kleiner, Kurt (October 2008). "Nuclear energy: assessing the emissions" (PDF). Nature Climate Change. 2: 130–1. ^ a b c Kidd, Steve (21 January 2011). "New reactors—more or less?". Nuclear Engineering International. Archived from the original on 12 December 2011. ^ Ed Crooks (12 September 2010). "Nuclear: New dawn now seems limited to the east". Financial Times. Retrieved 12 September 2010. ^ The Future of Nuclear Power. Massachusetts Institute of Technology. 2003. ISBN 0-615-12420-8. Retrieved 10 November 2006. ^ Massachusetts Institute of Technology (2011). "The Future of the Nuclear Fuel Cycle" (PDF). p. xv. ^ "Comparison of Lifecycle Greenhouse Gas Emissions of Various Electricity Generation Sources" (PDF). ^ a b International Panel on Fissile Materials (September 2010). "The Uncertain Future of Nuclear Energy" (PDF). Research Report 9. p. 1. ^ a b M.V. Ramana. Nuclear Power: Economic, Safety, Health, and Environmental Issues of Near-Term Technologies, Annual Review of Environment and Resources, 2009, 34, p. 136. ^ Matthew Wald (29 February 2012). "The Nuclear Ups and Downs of 2011". New York Times. ^ a b Benjamin K. Sovacool. A Critical Evaluation of Nuclear Power and Renewable Electricity in Asia Journal of Contemporary Asia, Vol. 40, No. 3, August 2010, pp. 393–400. ^ Arm, Stuart T. (July 2010). "Nuclear Energy: A Vital Component of Our Energy Future" (PDF). Chemical Engineering Progress. New York, NY: American Institute of Chemical Engineers: 27–34. ISSN 0360-7275. OCLC 1929453. Archived from the original (PDF) on 28 September 2011. Retrieved 26 July 2010. ^ a b Jacobson, Mark Z. & Delucchi, Mark A. (2010). "Providing all Global Energy with Wind, Water, and Solar Power, Part I: Technologies, Energy Resources, Quantities and Areas of Infrastructure, and Materials" (PDF). Energy Policy. p. 6. ^ Hugh Gusterson (16 March 2011). "The lessons of Fukushima". Bulletin of the Atomic Scientists. Archived from the original on 6 June 2013. ^ James Paton (4 April 2011). "Fukushima Crisis Worse for Atomic Power Than Chernobyl, UBS Says". Bloomberg Businessweek. Archived from the original on 15 May 2011. ^ Benjamin K. Sovacool (January 2011). "Second Thoughts About Nuclear Power" (PDF). National University of Singapore. p. 8. Archived from the original (PDF) on 16 January 2013. ^ Massachusetts Institute of Technology (2003). "The Future of Nuclear Power" (PDF). p. 48. ^ "The Bumpy Road to Energy Deregulation". EnPowered. 28 March 2016. ^ Federal Ministry for the Environment (29 March 2012). Langfristszenarien und Strategien für den Ausbau der erneuerbaren Energien in Deutschland bei Berücksichtigung der Entwicklung in Europa und global [Long-term Scenarios and Strategies for the Development of Renewable Energy in Germany Considering Development in Europe and Globally] (PDF). Berlin, Germany: Federal Ministry for the Environment (BMU). Archived from the original (PDF) on 27 October 2012. ^ "Advantages and Challenges of Wind Power". DOE. 12 February 2015. ^ John Wiseman; et al. (April 2013). "Post Carbon Pathways" (PDF). University of Melbourne. Archived from the original (PDF) on 20 June 2014. William D. Nordhaus, The Swedish Nuclear Dilemma – Energy and the Environment. 1997. Hardcover, ISBN 0-915707-84-5. Bernard Leonard Cohen, The Nuclear Energy Option: An Alternative for the 90's. 1990. Hardcover. ISBN 0-306-43567-5. Bernard Cohen's homepage contains the full text of the book.